Describing Rachel Timmins’ realm of work as simply jewelry does little-to-no justice to the outlandish repertoire of materials and sculptural forms she utilizes. She’s as comfortable and skilled with a sewing needle/thread in her hands, as the industrial powder coating gun that both create the palette of color (and backdrops) for her jewelry. Add into this mix her knowledge and ability to utilize a 3-D rendering software program known as Rhino CAD, and this is what Philadelphians were fortunate to see last Friday evening when Snyderman-Works Galleries opened Timmins’ solo show to a packed gallery of “First Friday” art attendees. Rachel Timmins, “Gem Cut”, 8″x 8″x 1.5″, 3D printed nylon, paint, rare earth magnets, 2013. Gem Cut is a “rapid prototype” necklace that Timmins draws in the Rhino program then sends digitally off-site to be 3-D printed in nylon. After the piece is returned to her, the artist meticulously hand-paints the nylon in turquoise and gold coloring while distressing and sanding the “gem facets” of the painted clasp to closer reveal the gem-cutter reference of this actually being an emerald-cut form. Cleverly, Timmins employs what she refers to as rare earth magnets to naturally close the neckpiece, as opposed to creating a traditional hinge or boxed clasp that would interfere with the simple beauty and economy of materials that make these neckpieces shine. Since the chain elements are printed dimensionally in the round, Timmins takes the motif of the eight-sided emerald-cut rectangle and harmoniously repeats this through the differing chain links that comprise the body of the jewelry piece. 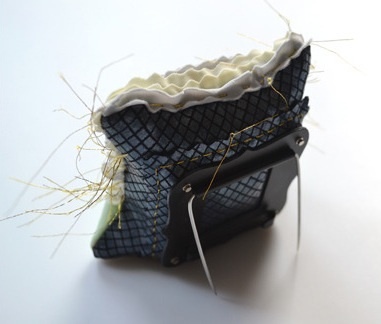 Rachel Timmins, “Comfort Four”, 3″x 3″x 1.5″, Spandex, thread, flax seeds, powder coated brass, stainless steel, sterling silver hardware, 2013. Comfort Four is one in a series of mixed media fiber and metal brooches that Timmins numerically names from Comfort One to Comfort Eight. It’s a double-color, overlapping wave pattern of cream and grey fabric likely cut with pinking shears that is delicately stitched by hand with metallic golden thread into a comforting pillow-like square form; however, when it’s turned over to the reverse, the wearer is confronted with a harlequin pattern over shiny black spandex. 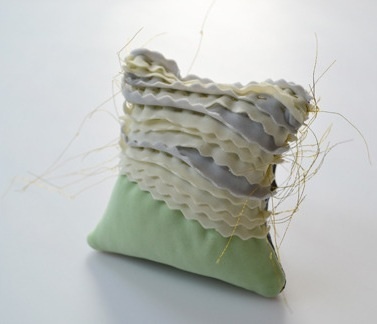 Rachel Timmins, “Comfort Four” brooch, (reverse) 2013. This is again sewn with gold thread but this time, Timmins adds a level of cold industrial “goth-like” darkness to the brooch by way of matte black powder-coated brass and sterling silver stud hardware. This dichotomy of the wearer seeking the soft, cushiony pillow form with muted pastel colors of the front is blasted right out immediately once the wearer turns the brooch around and allows herself/himself to see and experience the “wake-up call” of Timmins showing us how there just may be a hard-side to things that we normally may place to the rear of our own existences. Her material choice is genius here, as metalsmiths and jewelers have been intertwining textile, thread and metal for years, but rarely is there a “two-sides to the story” narrative like this brooch. Rachel Timmins: Jewelry can be viewed through September 29th, 2013 at Snyderman-Works Galleries located at 303 Cherry Street in downtown Old City, Philadelphia, PA. Images appear courtesy of Snyderman-Works Galleries, Philadelphia. Patricia- How fun to see the pieces that most inspired you at First Friday last weekend, and to read your interpretations of Timmins’s work. I’ve never seen a brooch that tells a story in quite this way. I love how you walk the reader through the process; your writing flows beautifully as you describe the juxtapostion of polar opposites (i.e., cushioned/sharp, dark/light). Thank you for sharing this post! Thanks so much, Gina Marie, for your lovely feedback! As many First Friday art crawls as I’ve done, this last weekend was the BEST array of artwork I’ve ever seen in Philly throughout all the downtown galleries. I want to add that ceramic sculptor Ruth Borgenicht (who also is exhibiting this month at Snyderman-Works) is another incredible show to see. Thanks again so much for stopping in and commenting! Anita, thanks so much for your candid commentary – it’s really valued. I’m blushing re: your flattering comments re: my own jewelry. As I prepare for upcoming shows, your comments give me even more determination to do my best. Since you are a painter and so incredibly gifted not just w/ color but also interpretation of your subject matter, I can see how you’d find a 3-D printed piece somewhat sterile. Thanks again for stopping by and sharing such great insights, as always!! Thanks Patricia, you always provide such a rich experience. That’s it, Sharon!! That’s exactly what I see also when I look at these “Comfort” brooches: how multi-dimensional we are as humans, and how the materials used on both sides just reinforce the idea. You’ve summed it up perfectly for me. Thank you also for your really generous compliments re: my blog. It would not be the same without your added insights and visits!! Great post, Patricia! I read it with a lot of interest, as I am really curious about 3-D printing and its applications for jewelry – but sometimes baffled and lost for words… Your description of Rachel’s necklace is really enlightening. The distressed painted finish adds, for me, a welcome “hand-made” flavour, as well as warmth. And there is a touch of self-referential humour – without it, I admit I would find the piece quite stark. Your analysis of her “Comfort Four” brooch made me want to see more – I love the “Squish” series on her website. Thank you so much for introducing us to such a talented and versatile artist who is not afraid to push the boundaries of her medium. Dominique, 3-D printing is almost a nightly discussion in my house (i.e. how its use is being noticed in fields outside art such as medical, engineering and more.) So when I saw the announcement for Rachel’s show in Philadelphia, I knew it’d be a medium I’d be interested in seeing further. 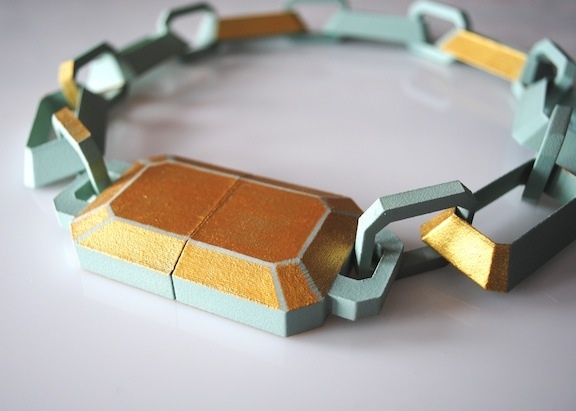 Although my own jewelry work touches on use of technology and software – I haven’t created pieces yet without metal; I agree – Rachel does not fear finding new ways and materials to push the envelope of what contemporary jewelry and metalsmithing is. As always – I really appreciate your thoughtful input and your visits to artdoesmatter! Thanks Dominique! An interesting journey through materials and processes for the uninitiated, Patricia. Thanks for being such a careful guide. So much to see through your eyes. I suppose every brooch must have a hard side – the fixing – but your explanation makes it the artistic obverse! Thank you, Philippa! While I do find most jewelry artists take great care with how they construct the back-of-the-brooch, Rachel is one of the few exceptions that incorporates what I view as a deliberate obverse vs. reverse tactic. It’s really exciting to see this in an actual object – not just one making “pretty pieces”. I appreciate you sharing your fabulous observations, Philippa!